Recording the past can be a tricky business for historians. Prophesying the future is even more hazardous. In 1901, shortly before the death of Queen Victoria, the radical writer William Digby looked back to the 1876 Madras famine and confidently asserted: “When the part played by the British Empire in the 19th century is regarded by the historian 50 years hence, the unnecessary deaths of millions of Indians would be its principal and most notorious monument.” Who now remembers the Madrasis? 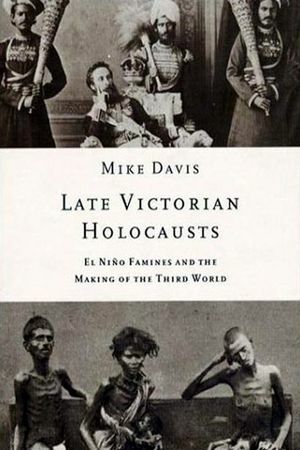 In Late Victorian Holocausts, Mike Davis charts the unprecedented human suffering caused by a series of extreme climactic conditions in the final quarter of the 19th century. Drought and monsoons afflicted much of China, southern Africa, Brazil, Egypt and India. The death tolls were staggering: around 12m Chinese and over 6m Indians in 1876-1878 alone. The chief culprit, according to Davis, was not the weather, but European empires, with Japan and the US. Their imposition of free-market economics on the colonial world was tantamount to a “cultural genocide”. These are strong words. Yet it’s hard to disagree with them after reading Davis’s harrowing book. Development economists have long argued that drought need not lead to famine; well-stocked inventories and effective distribution can limit the damage. In the 19th century, however, drought was treated, particularly by the English in India, as an opportunity for reasserting sovereignty. A particular villain was Lord Lytton, son of the Victorian novelist Edward Bulwer-Lytton (“It was a dark and stormy night…”) after whom, today, a well-known bad writing prize is named. During 1876 Lytton, widely suspected to be insane, ignored all efforts to alleviate the suffering of millions of peasants in the Madras region and concentrated on preparing for Queen Victoria’s investiture as Empress of India. The highlight of the celebrations was a week-long feast of lucullan excess at which 68,000 dignitaries heard her promise the nation “happiness, prosperity and welfare”. Lytton believed in free trade. He did nothing to check the huge hikes in grain prices, Economic “modernization” led household and village reserves to be transferred to central depots using recently built railroads. Much was exported to England, where there had been poor harvests. Telegraph technology allowed prices to be centrally co-ordinated and, inevitably, raised in thousands of small towns. Relief funds were scanty because Lytton was eager to finance military campaigns in Afghanistan. Conditions in emergency camps were so terrible that some peasants preferred to go to jail. A few, starved and senseless, resorted to cannibalism. This was all of little consequence to many English administrators who, as believers in Malthusianism, thought that famine was nature’s response to Indian over-breeding. It used to be that the late 19th century was celebrated in every school as the golden period of imperialism. While few of us today would defend empire in moral terms, we’ve long been encouraged to acknowledge its economic benefits. Yet, as Davis points out, “there was no increase in India’s per capita income from 1757 to 1947”. In Egypt, too, the financial difficulties caused to peasants by famine encouraged European creditors to override the millennia-old tradition that tenancy was guaranteed for life. What little relief aid reached Brazil, meanwhile, ended up profiting British merchant houses and the reactionary sugar-planter classes. Davis’s attention to the importance of environment may recall the work of the Annales school of historians, but he is far more radical than any of them. His writing, both here and in such classic books as City of Quartz and Ecology of Fear, is closer to that of Latin American intellectuals such as Ariel Dorfman and the Urguayan, Eduardo Galaeno, who for decades have spotlighted capitalism’s casual abuse of the third world and who have sought to champion the poor and dispossessed. Such commitment, forcefully and lucidly expressed, is unfashionable these days. Anirudh Krishna, ed. (2008) Poverty, Participation, and Democracy: A Global Perspective, Cambridge: Cambridge University Press, pp. 189. Poverty, Participation, and Democracy, which grew out of a workshop organized atDukeUniversity in 2006, brings together six brilliant papers by renowned scholars from different disciplines. The central question addressed here is, what is the relationship between poverty and democracy? The classic studies on democracy by S.M. Lipset, Barrington Moore and Samuel Huntington have all shown that there exists a negative correlation between poverty and the development of democracy. Their works also suggest that “the more well-to-do a nation, the greater the chances that it will sustain democracy”. However, by building on historical experiences and examples from Africa, Asia, and Latin America, the authors of this volume argue that “poor people do not value democracy any less than their richer counterparts” (p.9). Their observations show that it is the educational level of people, rather than wealth and income that provide a positive correlation with the emergence and consolidation of democratic political regimes. This book has six chapters. The introductory essay byKrishnasets the context for the book and outlines its main arguments. He provides empirical evidence that challenges the conventional wisdom, which advocates that “democracy tends to be stronger in richer rather than poorer countries” (p.7) and poor people participate much less than others in various democratic activities. The Indian case provides a fitting example where the poor participate more intensely than the rich in the electoral democratic process; democracy has not only survived inIndiabut also has become sturdier over the last six decades amid unfavorable conditions like high levels of poverty and illiteracy. Increasing participation by the poor in the democratic process is also shown to have occurred in Africa and Latin America. Bratton as well as Booth and Seligson find that the major cause for this is the increase in education and political awareness among the people. Przeworski argues that it is not the poor but the rich and their fear for “redistribution” that threatens the viability of democracy. In order for democracy to become more firmly consolidated within the poorer countries, Krishna and Booth argue in the concluding chapter that middle-level “institution building” should be encouraged as they will not just provide viable means of representation for the poor but also will make the “everyday practices of governance” accountable and transparent (p.152). The book suffers from three shortcomings. First, building institutions does not always strengthen democracy since institutions do not have, as Hadiz (2010) notes, “a life of their own that is independent of context”. They could be dominated by predatory interests that might undermine democratic governance. Secondly, there is no discussion on globalization, which is intimately related to poverty and democracy. Finally, the chapters look repetitive as they all use Lipset’s work as the basis of their discussion. Despite this, the volume’s methodological sophistication and theoretically insightful essays will be a significant contribution to the students of political sociology and comparative politics. Note: Reviewed by Sahoo. S. (2011) in Political Studies Review, Vol. 9, pp. 258-259. Globalisation has had far-reaching implications for the dynamics of liberal democracy and governance in India. With the opening of the Indian economy in the 1990s, global market forces and private sector organisations have played an increasingly significant role in the political life of the nation. Given this background, several central questions are addressed. How has globalisation affected the way that state and civil society relations in India are constituted? In particular, what are its political implications for the poor who had previously relied on the services provided by the post-colonial state that carried out significant welfare-orientated functions? The paper argues that the contradictions of globalisation have transformed the dependent identity of the poor and marginalised toward a greater propensity for collective mobilisation. While the longer-term outcomes of such mobilisation remains unclear, the hegemonic position of entrenched elites is more clearly being challenged by the emergence of new agendas of inclusion, welfare rights and social justice appearing under conditions of neo-liberal globalisation.